What are your goals for the new year? 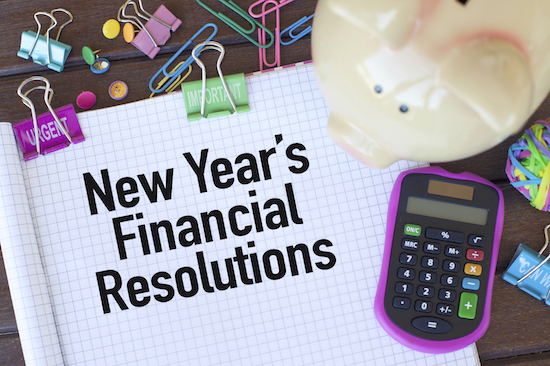 If your personal finances need a tune up, these are some suggested financial resolutions to look at as you head into 2016. Did you ever wonder what you did with your money? Make 2016 different by being proactive and making a plan to fund what is important to you. Maybe you want to pay off credit card debt. If you have a $12,000 credit card balance and want to pay this off in two years, use a financial calculator that will incorporate the interest rate to get your monthly payment. You must make this a priority. The best way to make this happen is to schedule automatic payments from your bank account. Or maybe you want to redo your kitchen which will cost $15,000. How much can you afford to save every pay period? If you get paid bi-weekly and want to have this done by next summer, you will have to save $416 a pay period. If you can’t do this, don’t throw in the towel. It may take you two or three years to fund this goal but at least you will have a plan in place. Longer term goals such as college planning and certainly retirement planning take a little more consideration since you are likely to invest in stocks, bonds, mutual funds, exchange traded funds, annuities, etc. You also need to know how the various retirement plans work and the tax laws associated with them. Schedule a meeting with a financial advisor to create or review your retirement strategy. How much do you need in savings to sustain your retirement over your life time? First you need to determine how much income you need to pay your needs and wants. Your needs are your necessary expenses: utilities, car payments, insurance, taxes, etc. Now what do you want to do in this phase of your life: golf, travel, classes, dining, music lessons, boating, and so forth. I recommend coming up with a monthly figure, and make sure it is a net after tax amount. How long do you expect to live? Of course no one knows the answer to this but you do not want to outlive your money so at least plan for a long life expectancy. A starting point is to take your desired monthly net income and multiply by twelve. You must consider inflation so take your annual total income and see what it will be in the year you plan to retire. You can use an online inflation calculator. Next, subtract out your estimated Social Security, which you can get off www.ssa.gov, and your estimated pension, if you are fortunate enough to be getting one. Now, multiply this amount by your life expectancy. This will give you a rough idea of what your savings goal should be, but remember this is a net number so you must increase it by what you think your tax rate will be. This is very rough because we are not considering what rate of return you expect to get on your investments as well as ongoing inflation in retirement. Now that you have an estimated goal how much do you need to save out of every paycheck to reach that goal. This is when it is best to work with a qualified financial advisor to not only help you plan, but to monitor the plan and track your progress. Invest in a way that is appropriate for your objectives and your comfort level. I taught a class on the Thrift Savings Plan at the US Patent office in January 2014. Many of the participants were in high spirits because the S & P 500 index had finished 2013 with an increase of 32%. At the end of the class a woman came up to me and showed me her statement. She was invested 100% in the Government Fund (G), which guarantees not to lose principal. The G fund’s annual return for 2013 was 1.89%. My comment to this woman was that if she was not comfortable with any risk and was able to reach her goals with this rate of return, then she was doing very well. The point is that you have to manage your investments for growth as well as risk. It is very important to know your comfort level and allocate your investments accordingly. The best way to do that is have a thorough review of your investments and determine if you have too much or too little at risk based on your risk tolerance. We have a simple risk questionnaire that we can email to you. Click here to request the Riskalyze questionnaire. Recognize that taxes are very likely to go up in the future and add some taxefficient strategies to your retirement plan. Current tax rates are low. In the past the federal tax rate has been as high as 94%. With our federal deficit over 18 trillion dollars and unfunded entitlement promises close to 100 trillion, where is the funding going to come from to get this in control? You can’t fix the deficit, Social Security, and Medicare, but you can be proactive and use tax efficient strategies to protect against the threat of higher taxes. Do you contribute to a Roth IRA? Even better, does your employer offer a Roth plan which would allow you to contribute $18,000 for 2016 and an additional $6,000 if you are age 50 or over? Our present low interest rate environment makes for a difficult time to be a conservative investor. Bank interest rates are very low and bond funds are very sensitive to rising interest rates. You may have to change your investment strategy and look to equities that pay dividends, but be careful; the complexity in the markets today require advanced skills which is where the need for professional active management fits in. Adding a fixed indexed annuity allows you to participate in stock market performance without risk to your principal, and can work nicely as a bond replacement in this environment. Guarantees are based on the claims paying ability of the insurer. Include long-term care planning in your retirement strategy. If you had an unplanned expense of $60,000 to $100,000 a year, could your income support that during your retirement? There is a 70% chance that you can drain your finances and put an emotional drain on your family. Imagine having a healthcare need and not having the funds available to pay for this care, thus relying on family to care for you. This can put tremendous tension on a family and cause their health to decline as well. Many people choose not to purchase a long term care policy because they can spend tens of thousands of dollars in premiums and then end of never using the policy, leaving all that money behind to the insurance company. Hybrid life/long term care plans are gaining more popularity. These pay out a death benefit if you don’t use the policy for your long term care needs. Many plans build cash or refund your premium should you decide to cancel the policy. Before purchasing an impulse item, give yourself a time period to think if the purchase is something that you really want to make. Will it still allow you to meet your savings goal? Would the money better be used toward a payment on a credit card? If shopping at the mall and you see a really cute pair of shoes and they are 50% off, tell yourself that you need a day to think about this purchase. You are not saying no, you are going to logically think it through. If a day seems like too much time because you will have to drive an hour back to the store, then at least give it an hour. Go have a cup of coffee and think about the pros and cons of buying the boots and then make your decision. Before you reach Medicare age, consider a High Deductible Health Insurance plan which will enable you to have a Health Savings Account (HSA). An HSA can be extremely beneficial in planning for healthcare expenses because they offer triple tax savings: (1) contributions are tax-deductible, (2) interest inside the HSA grows tax free, and (3) distributions for qualified health expenses are tax free. For 2016, the maximum contribution is $3,350 if you are single and $6,750 for a family. Update beneficiary forms and get copies from the plan because banks, employers, mutual fund companies and brokerage firms can lose things. The beneficiary form trumps what your Will says. If your Will states that your IRA should go to your husband, but the beneficiary form states the primary beneficiary is your son, then your son will inherit the IRA. Provide your advisor and estate attorney with copies of your signed beneficiary document. Make sure you have adequate life insurance if you have others that rely on your income and/or if you have debt. How would your family be effected if you had an unexpected death? Besides missing you terribly, how would they manage without your income? Life insurance can be a blessing, but it can be complicated to determine how much you need and the best plan for you. An extra benefit that is available on some Universal Life policies are Accelerated Benefit riders that pay out if you have a chronic Illness or a terminal illness. As an example, Tina is 45 and has a $500,000 death benefit on her universal life policy. She has determined that $1,000,000 would be enough life insurance to supplement her husband’s income to provide for their three children ages eighteen, fourteen and twelve. Fast forward thirty- five years. Tina is now 80 and has taken ill. She has mild dementia and needs assistance with bathing and even walking on some days. She can use her $1,000,000 death benefit to pay for home care, or care in an assisted living or nursing facility. Any benefit not used will pass on to her heirs, all tax free. What Does a Qualified Financial Advisor Look Like, and Where Can I Get One of My Own?